Mansfield District Council has said that residents were not alerted about today's Top Gear event because "filming wouldn’t have gone ahead if word had got out in advance". The BBC's hit car show Top Gear took over Mansfield town centre this morning, February 10, with new presenters Freddie Flintoff and Paddy McGuinness and current star Chris Harris racing through the town. 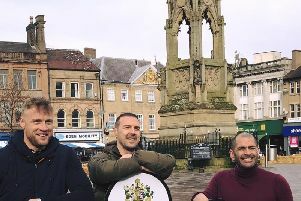 Top Gear hosts Freddie Flintoff, Paddy McGuinness and Chris Harris in Mansfield's Market Place. However residents were not alerted about the arrival of the TV stars, instead only being alerted of the road closures resulting from the event and given an advanced apology from the organisers. Mansfield District Council defended the stance to not alert residents about Top Gear's arrival, suggesting that the public may not have been safe "in the event of a crash" had big crowds turned out to view the event. A spokesman for the council said: "We’re sorry we’ve been keeping a secret from many of you! The race on West Gate and Market Place. "We can now confirm that BBC Top Gear presenters Chris Harris, Freddie Flintoff and Paddy McGuinness were in Mansfield this morning filming for an episode of the hit BBC show. "The programme, which has an estimated global television audience of 350million, came to Mansfield to investigate the pros and cons of electric cars on a circuit around the town centre. "There was plenty of action and the smell of burning tyres as seven cars did loops around the inner ring road. Freddie slightly lost control and crashed into an empty market stall - nobody was hurt. The race on Market Place. "This shows the most important thing when holding a driving event like this in a town centre is ensuring people are safe, which is why this couldn’t be publicised. "We were sworn to secrecy by the BBC because of concerns about safety if a large crowd had turned up to watch. There was a risk that filming wouldn’t have gone ahead if word had got out in advance. "On behalf of everyone involved, thank you to all those who helped to ensure everything went smoothly. Thanks also goes to all those who knew what was going on in advance and kept their lips sealed." Freddie Flintoff with resident Hayley Goddard. Residents had suggested that the council "missed a trick" by not advertising the event. Chad reader Samantha March said: "Mansfield could have benefited from this. Getting people in the town centre today. Instead yet again they got it wrong." Marie Wood added: "Mansfield District Council should have advertised this so more people could of gone to watch it." It is understood that the filming will not feature in the forthcoming season of Top Gear, which still features former host and Friends star Matt Le Blanc. Mansfield District Council said it expects the footage to be shown "in the summer". Paddy McGuinness popped into The Garrison on Leeming Street.